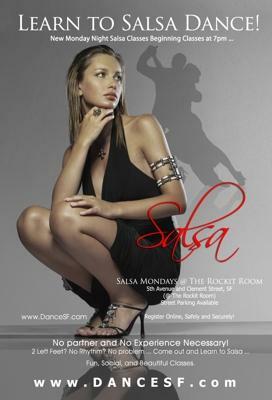 The Friendliest, Sexiest, Hottest Salsa Night in The Bay Area! These dance classes are large, fun, and social. Beginning Salsa Classes @ 7pm! No partner necessary ...No Experience is Required. Intermediate Salsa Classes @ 8:30pm and then open salsa dancing! Singles? Couples? Groups of Friends? Come out and Learn Salsa!